Established in 1949 with the blessings of his Holiness Sri Swami Sivanandaji Maharaj of the Divine Life Society, The School has stood by the values of its illustrious founders. We strive for total Quality Education for all our students, Working on all dimensions of a child's development academic, Physical, Creative, moral & spiritual. 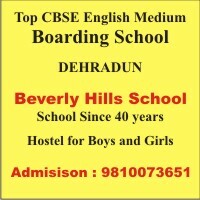 The School is affiliated to the Central Board of Secondary Education. The Central Board of Secondary Education is well known and is recognized not only in India but in many other countries as well. The Curriculum is widely recognized as most suitable for competitive examinations designed by UPSC & other examining bodies.